Tonight I did something I always try to avoid at any cost. The idea of talking to a group of people makes me lose sleep, no matter the group or the subject. In my public speaking class in college I considered it a success as long as I didn’t pass out during my speech. Whenever I present to a group my face heats up and turns a lovely shade of red. I hate it. I know people see it, but no matter how hard I try to psych myself out there’s nothing I can do to prevent it from happening. Two weeks ago, a fellow NaNoWriMo participant invited me to a creative writing group near my house that meets once a week. When he asked I was elated – just the thing I’ve been looking for! But, then the reality of it set in. I would be sharing my writing, MY writing, to a group of other writers face to face. That is scary. Well, I sucked it up and went to the meeting. I’m so glad I did. Red faced, with a shaky voice, I read out loud an excerpt of my NaNoWriMo novel to them. The responses rocked my socks! Also, the pieces everyone else read were amazing. I never realized how much I could learn by listening to discussions of writing, any writing. When I left I was giddy and proud of myself. For me, it was truly a fear conquered. Can’t wait until next time! Good for you - it's amazing the support and inspiration that can come from like minded people. Taking a risk - challenging ourselves pays off! Maybe you can write that into your NaNo? Onward and upward - to 50K! Thanks Kristy! I am having so much fun meeting writers. You're right about finding support and inspiration there. Nice article, Lillie. It's always good to step outside of your comfort zone from time to time. I had my first keynote speech a few weeks ago about my upcoming release. As a new author, it was a little scary, but I felt really good about the experience. Keep up the good work. Well done! I am fine reading things out to large groups if it already written. My fear is public speaking if there is no script. However, my greatest fear is having to sing in front of anyone because I really can't! Jack: That made my heart kick up a little just reading 'keynote speech' :) I agree though, getting out and just doing it is worth it! Adam: Thank you! Unscripted I haven't done. That would be scary for sure! Haha! My voice should never be heard outside of a car or shower. Good for you Lillie! I am timid and shy as well. 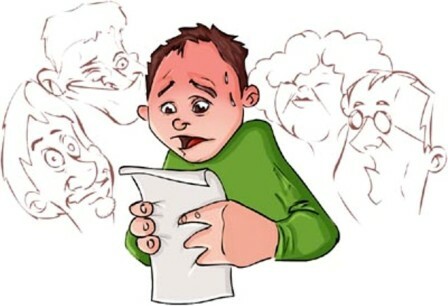 My face will turn so red when I introduce myself in front of class or read material. I feel your pain Stephanie! No matter how many times I tell myself to 'be cool' I never am :D Being able to speak well in public is a talent I do not possess! Way to go Lillie! There's nothing quite like that feeling of pushing yourself to do something outside your comfort zone, and the sense of achievement afterwards! Plus the support and motivation from the other writers, sounds like it was a great experience!